This shop has been compensated by Collective Bias, Inc. and its advertiser. All opinions are mine alone. #ICantEven #BigLots #CollectiveBias. I truly don’t get to travel as often as I’d like to, but when I do, I am really picky about hotel rooms. 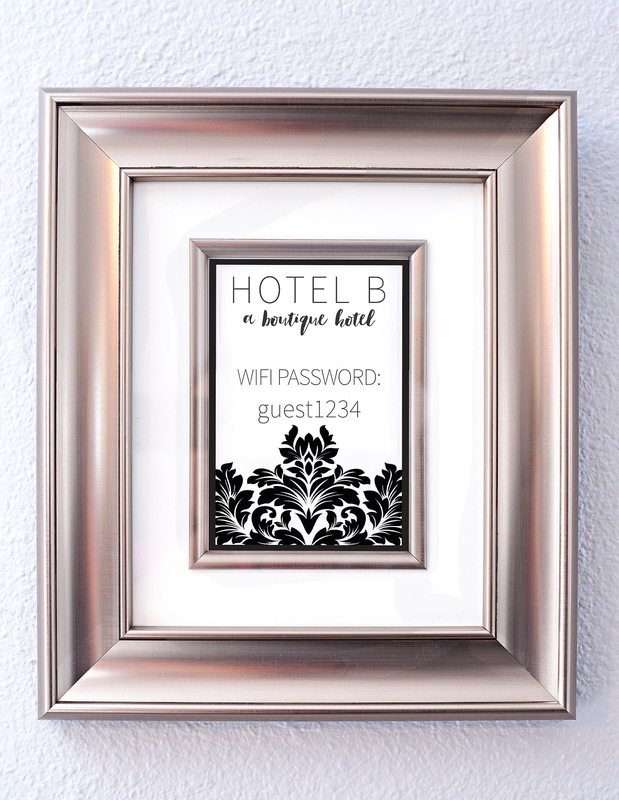 I often seek out boutique (non-chain) hotels because I love their decor and design choices. 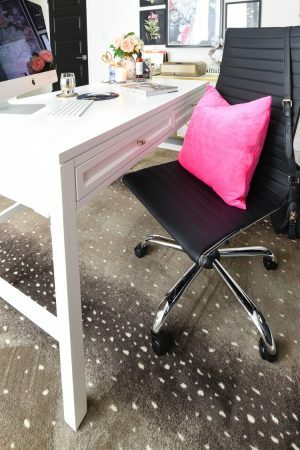 They tend to have unique furnishings, eclectic decor, accent walls, and bold accessories in a small, well utilized space. 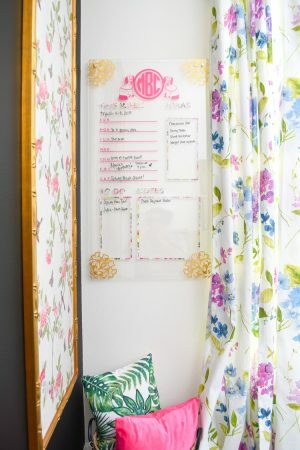 I always take notes, and I’m excited to have made our neglected guest room into a boutique chic guest room. Our guest room used to be the island of misfit (and old) furniture pieces. We had random pillows, ottomans, and decor that made for a really disjointed space. Also, we had a tiny full bed facing the window, which I am sure is annoying when the Texas sun beats through the window in the morning. And a HUGE dresser took up a lot of space. Here are our before pics. Before I re-design or decorate a room, I try to do a space plan using actual room measurements on some graph paper to see if the furniture will fit well. After that, I plan out any accent walls. For this room, a queen bed/mattress was the perfect size, and simple framed wall moldings really give a classy feel to the space. 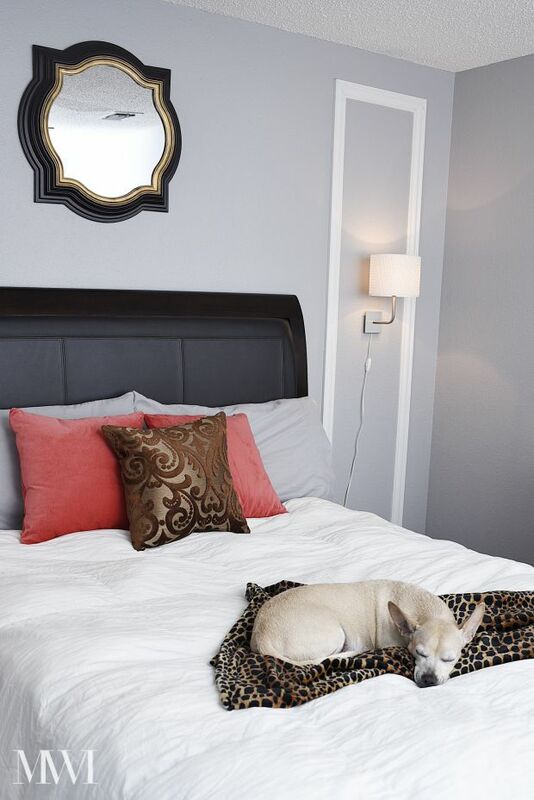 I wanted the bed to be dark and luxurious, so the Kingston bed from Big Lots was a fabulous pick and value. 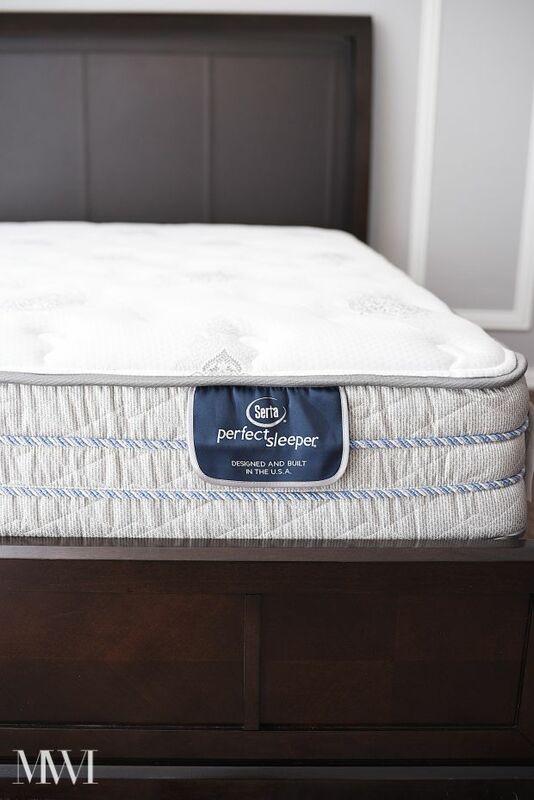 We also chose a Serta mattress that is the perfect combo of soft, yet firm and supportive. 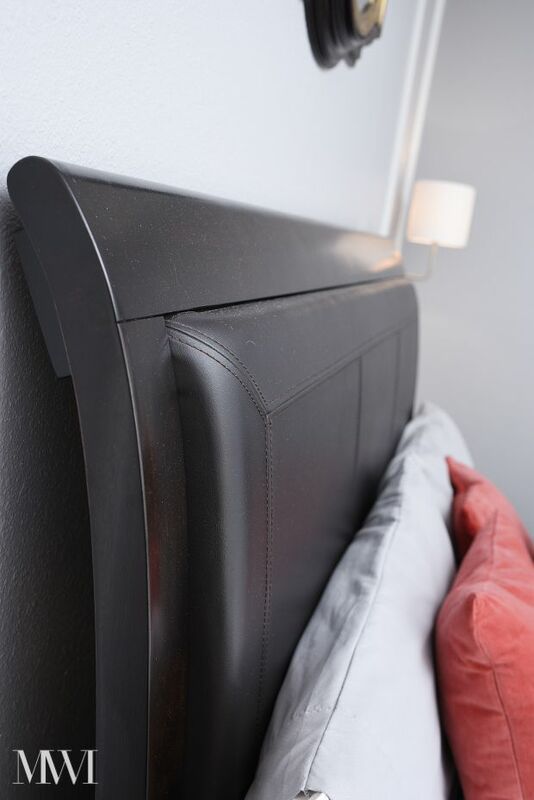 The padded headboard is comfy for late night reading, plus the height of the headboard gives the room a regal feel. Proper scale for the room, timeless qualities, and comfort are non-negotiables when it comes to large furniture investments. After the accent wall is finished and furniture is assembled, it’s time to decorate! Now, I love decor as much as the next person, but I am a fan of dual purpose decor. You want function AND beauty, especially in a small guest room. Big Lots has so many gorgeous, trendy, and quality furniture and decor options at their stores (Styles and assortment vary by store). We had the best experience with Adam and Doug over at the Victoria, TX location– I can’t give those employees enough praise for being so helpful when we went shopping. The furniture was towards the back of the store and was nicely set-up. 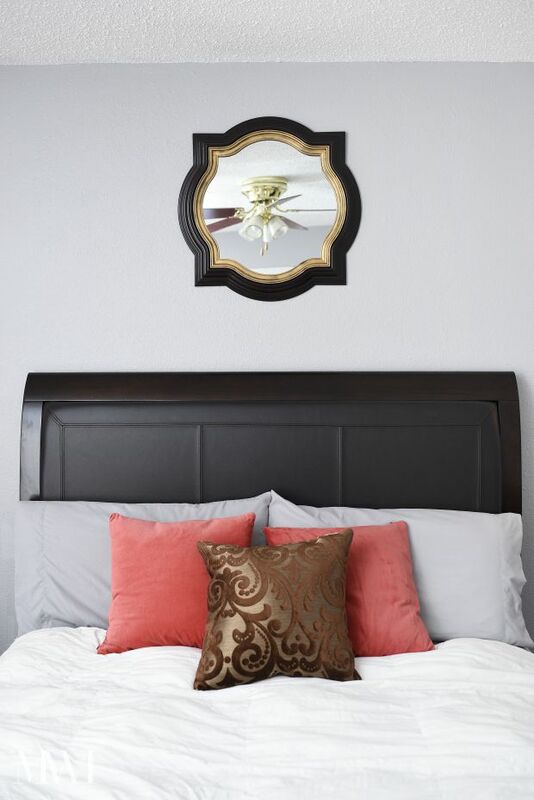 For a bedroom, some functional decor picks are throw pillows, curtains/curtain rods, wall decor, mirrors, and candles. 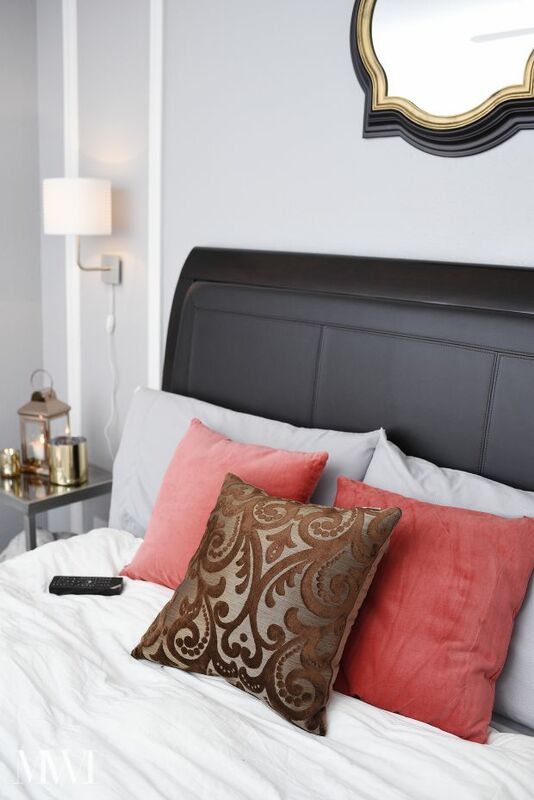 I chose a brown throw pillow to provide both texture and contrast to the bedding. 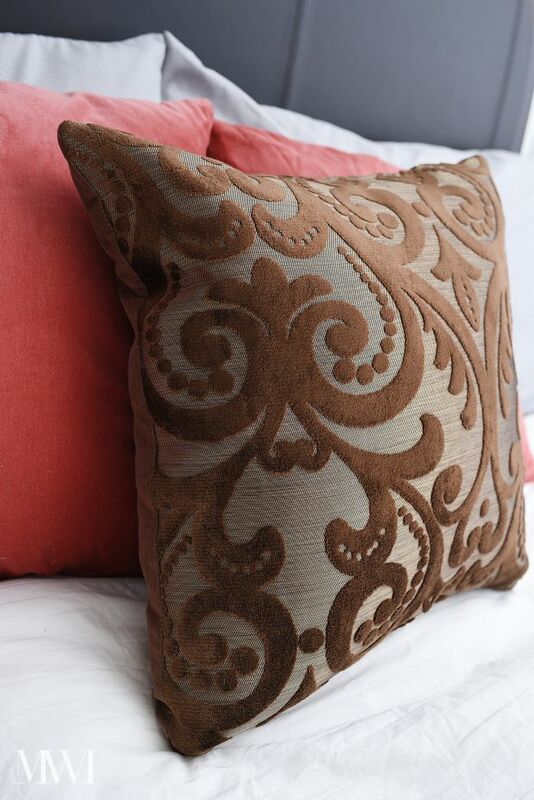 The damask scroll pattern is beautiful and velvety. 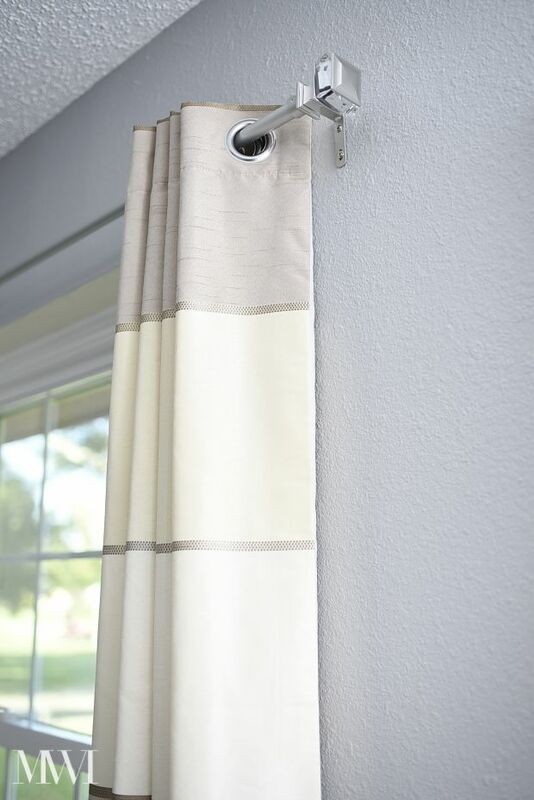 I used curtains I already had on hand, but a new curtain rod really adds a dash of glam to a room. Big Lots had lots of blackout curtains in various patterns and colors, and these are great to ensure a good night’s sleep. Big Lots also had wall decor in a variety of finishes, colors, and sizes. 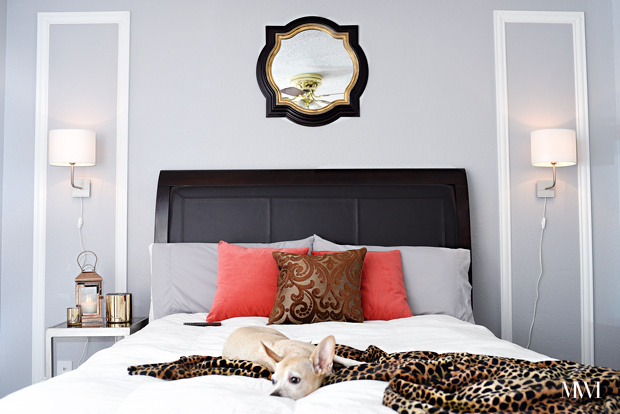 I opted for a 24” mirror to hang over the bed to help bounce light around the room, as well as a metallic frame to share our Wifi password with guests. I think little touches like this really make guests feel welcome, and I notice all the good hotels do this sort of thing too. Candles are a smart accent to any room (when used safely; if not LED/flameless options are good, too). They can immediately fill a room with a scent and cozy glow. 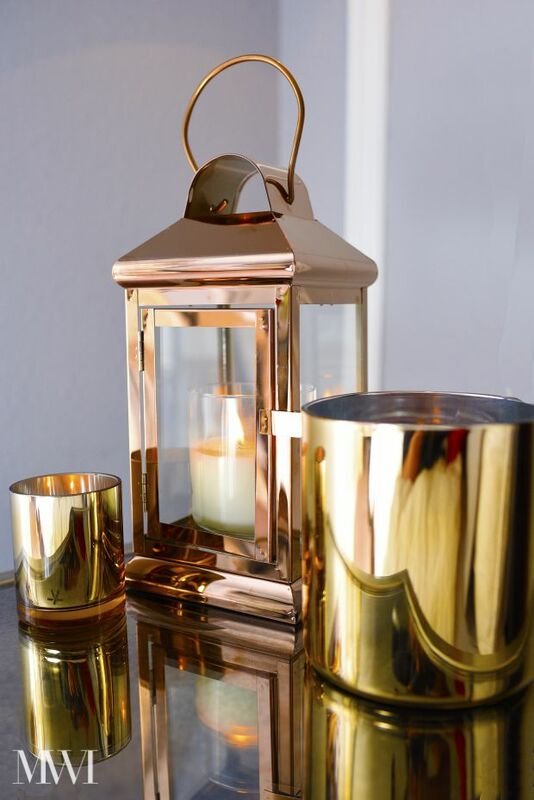 I fell head over heels in love with this rose gold lantern at Big Lots. Metallics are always in style, so it’s a good investment in a timeless decor piece. Pairing the lantern with other candle holders I already had creates a bright impact in this makeover. Overall, I think it’s important to always keep form and function in mind when decorating bedrooms. It should be restful, clutter free, purposeful, and luxurious. If it passes the Pee Wee test, I know I’ve done a good job. Here are a few more shots of the room to give you a feel of the small space. I truly love it! 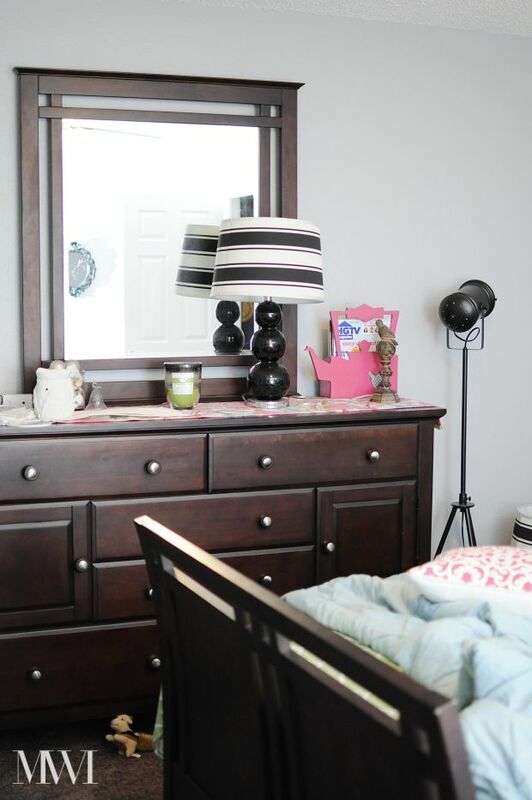 The whole room feels transformed, but all it took was smart, simple changes. 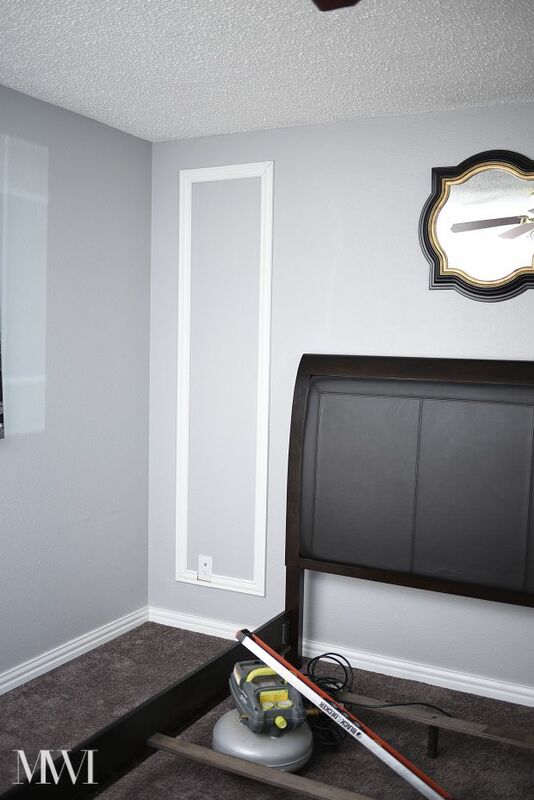 Moving the bed to a different wall and adding moldings really makes the room feel larger. New decor pieces blended with old provides a fresh and modern color palette that is a bit unexpected and fun. 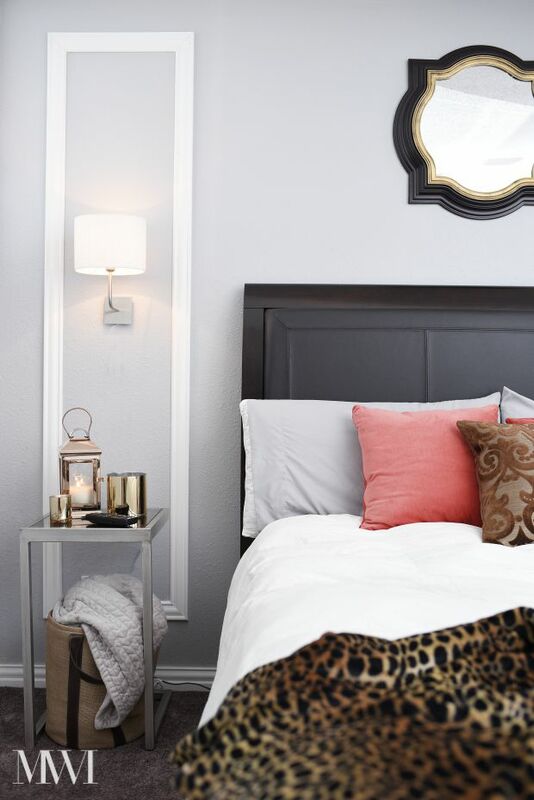 I accomplished this entire makeover in one weekend, so it’s proof that you don’t need to spend tons of money or time to make a huge impact in your home. Hope these ideas help you, and that you’ll keep Big Lots in mind (like Pee Wee does, see below!) 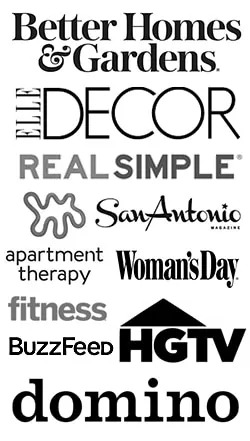 when planning your next home decor project. 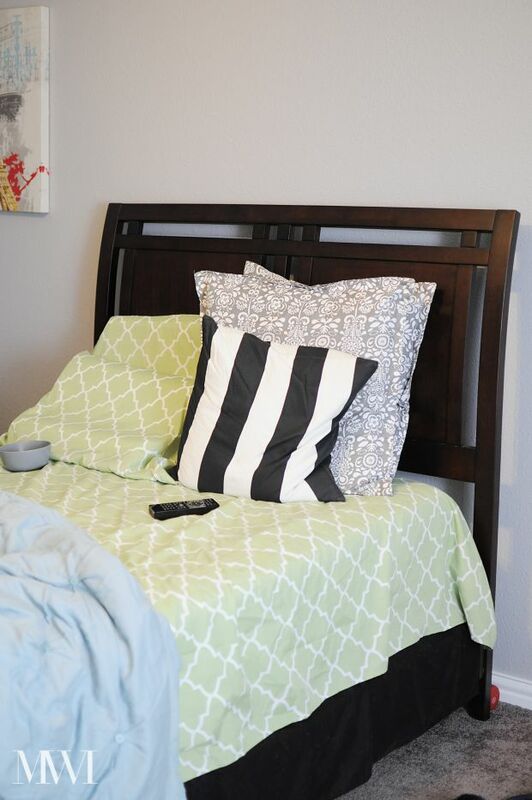 You can also find Big Lots on Pinterest if you want to start curating ideas to get those guest bedrooms ready for holiday guests! 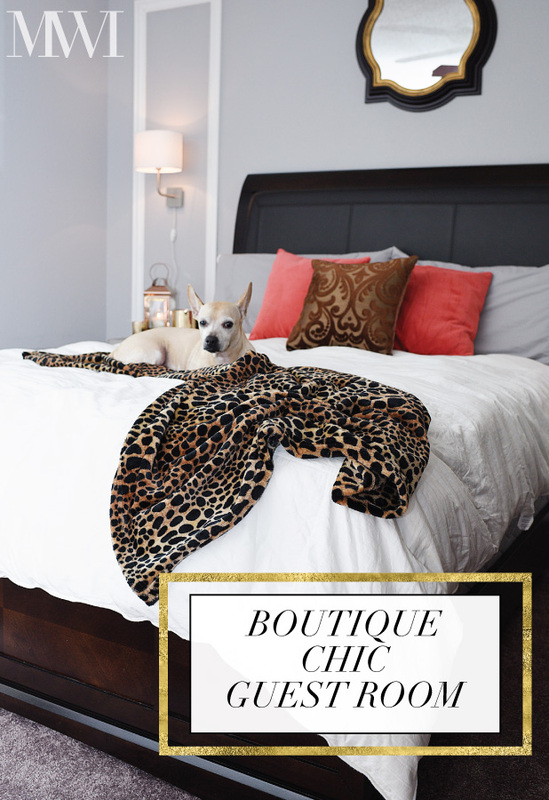 What are your tips for making guest rooms chic and beautiful? Guest room? I would love if my bedroom looked half this good 🙂 Great job! This looks great! We have a Big Lots shop around here, I need to go in there! Those pillows are lovely. Thanks for sharing your beautiful decor. Sharing your post! Love the guest room, Monica. It does look like it has that "boutique hotel" feel. Great job! Hi there! 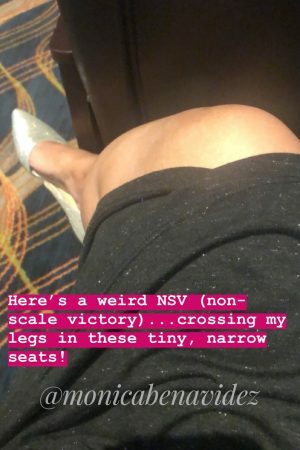 I love reading your blog and today was such a treat! Who would've thought you'd find all those great pieces at Big Lots? Ha, and I am such a snob, I never shop there. However, I have a chest of drawers from Big Lots and it is gorgeous. A friend sold it to me years ago, it is solid and well made. 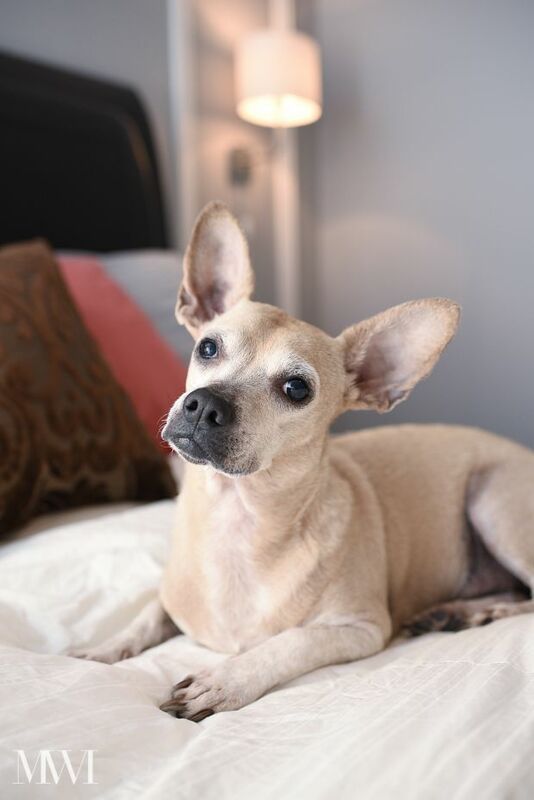 Love your new room and Pee Wee too. Thanks girl!